Victims of Science CD. SOLD OUT! The GAMMACIDE Victims of Science CD is SOLD OUT. We are currently in negotiations with a couple different record labels who are interested in licensing this CD. Check back for more info. You might be able to get some thru Brainticket Records. Sorry, the GAMMACIDE T-Shirts are all sold out. Congratulations to Gammacide drummer Jamey Milford and his wife Cheri on the birth of their daughter Annalyn Renee Milford! Formed in 1986, Gammacide marked its 20th anniversary this summer (Aug 3 thru 6) by spreading its highly toxic thrash metal throughout their home state of Texas. Five shows were played in Austin, Houston, Dallas and Fort Worth. Justin Press of the Fort Worth Weekly did a feature article on Gammacide just as the tour was commencing. Click here for photos from the Austin show, courtesy of Texas Metal Underground. Click here for a feature article in Austin's Whoopsy Magazine. Our longtime friend Russ contributed a slideshow of his photos from our Dallas show at the Galaxy. Here is a slideshow of photos from the Fort Worth show from Wild Child. For more pictures of Gammacide's recent Texas tour check out our updated images gallery. The first pressing of Gammacide's CD reissue of Victims of Science is almost sold out. Visit our Merch Stand to grab a copy before they are all gone. We also have a few shirts left over from our 20th Anniversary Tour. 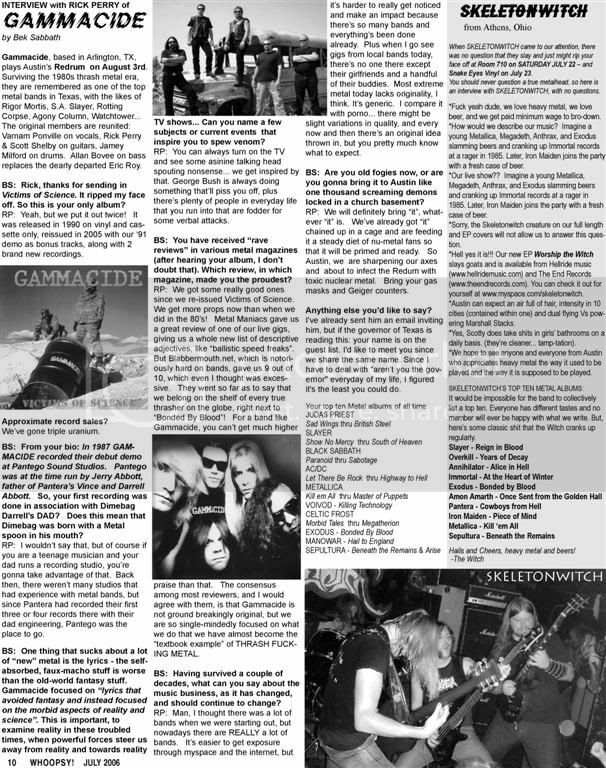 Heavy Magazine from Europe included Gammacide's "Against The Grain" as part of it's Metal Crusade Vol XII CD, which was included in their July/August issue (Number 93). Heavy is a full-color, glossy magazine with a circulation of over 10,000 per issue! Marquee Records in Brazil has released Victims of Science in South America as part of it's Classic Metal series. This edition features additional color photos, artwork, and band history in the expanded booklet. Gammacide members Rick Perry, Scott Shelby, and Alan Bovee recently formed the Texas Metal Alliance, along with members of other notable North Texas metal bands Rigor Mortis, Hammer Witch, Rotting Corpse and When Life Has Ceased. The TMA played a special performance on October 21 with all proceeds going to benefit Hammer Witch bassist Wayne Abney, who suffered a near fatal motorcycle accident on Aug 2. For pictures and more info on the Texas Metal Alliance, visit myspace.com/texasmetalalliance.